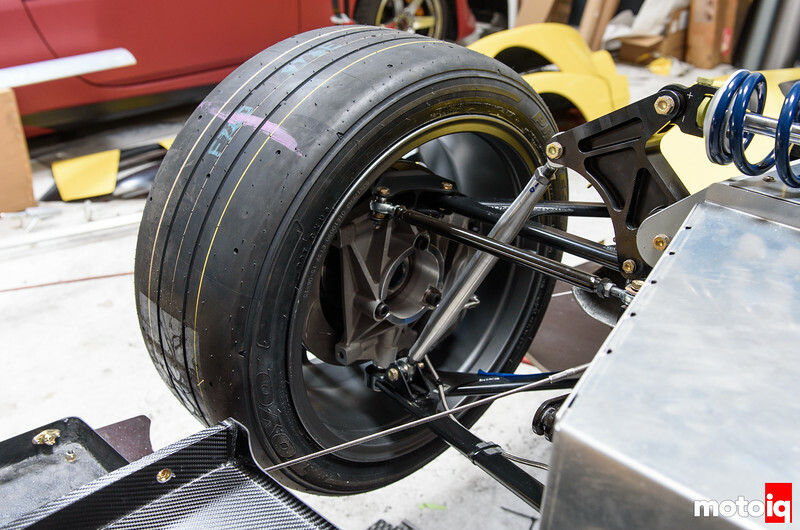 The front suspension is installed as well. Note that the same upright is used in all four corners. This saves a lot of cost in spares- a cool feature of the NP01. The interior is fully installed and all of the electronics are now wired. 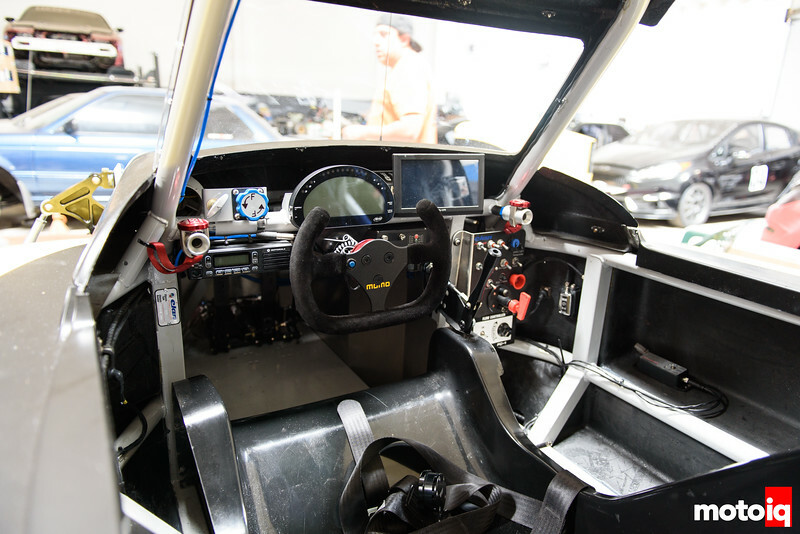 The switches, main cutoff, brake bias adjust, cool suit control, and window nets are all installed. With most of the mechanical assembly done, work started on the car’s cosmetics. Instead of paint, it was decided to wrap the bodywork. A wrap is great for a race car; it can be repaired quickly and can be changed quickly for new looks and new sponsors. Of course, to get a good surface finish, the composite body panels needed to be prepped almost to the degree as if they were going to be painted. The rough parts of the panels were sanded and filled with primer to be smooth so minor defects would not be seen through the wrap. 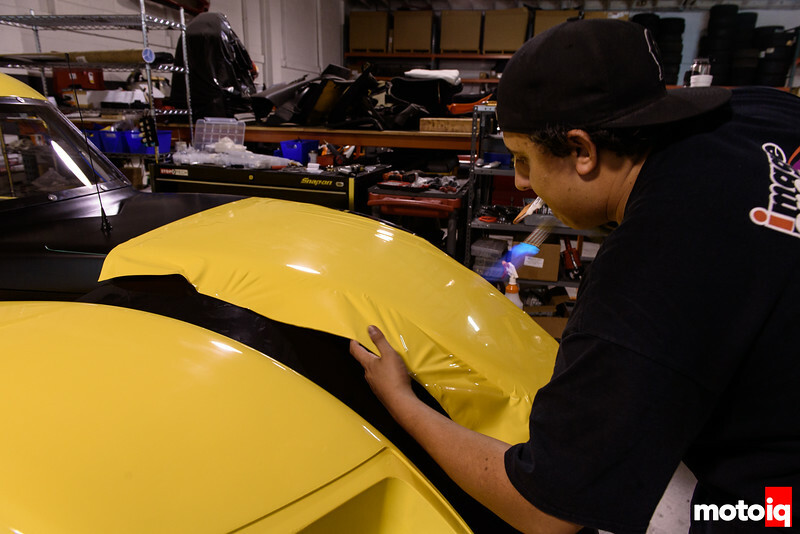 The wrap film is stretched over the bodywork by hand to get most of the wrinkles out. It is sort of like a giant decal. The wrap is sprayed with a water and detergent mix and is squeegeed down to remove bubbles from beneath it. The wrap’s adhesive has small channels in it to help evacuate the air. The adhesive is only moderately sticky, so it can also be moved around quite a bit before it is squeegeed down. The wrap is two toned, gloss yellow and matt black. Andrew is finishing up some details like gold kapton insulating film on the firewall and the underside of the air box. He also is installing the ram air scoop for the airbox. The scoop gets a good shot at the cold and high-pressure air above the roof’s boundary layer and contributes to a few horsepower at speed.